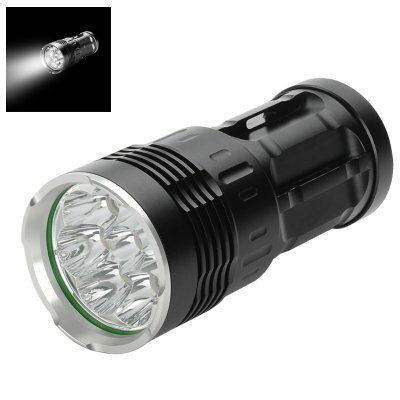 Successfully Added Skyray CREE T6 LED Flashlight - 6400 Lumen, Cree T6 XM2 LEDs, IPX6 to your Shopping Cart. Your go to torch for outdoor adventure needs tro be tough, waterproof and provide great lighting. The Skyray does just that and with its sturdy aircraft aluminum alloy body it won't let you down. Powered by four 18650 rechargeable batteries, that are sealed away behind a silicon 0-ring for that all important IPX6 rating, the Skyray flashlight pumps out 6400 lumens of light thanks to its impressive 8 Cree CM-2 T6 LEDs. 3 different lighting modes (high, medium & strobe), are accessed using the side click switch and the torch can be used in your hand or hung from a convenient location using one of the lanyard loops built into the body of the flashlight. A perfect torch for illuminating campgrounds, walking the dog, hiking in the hills or kept in the home for emergencies this compact torch can cast its beam between 100 and 200 meters so your wont be left in the dark with this great gadget by your side. This 6400 Lumen flashlight comes with a 12 months warranty, brought to you by the leader in electronic devices as well as wholesale LED lights..